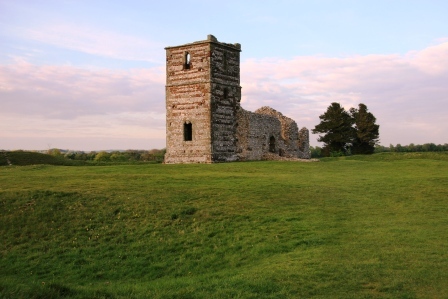 Surrounded by a Neolithic earthwork, the hollow shell of Knowlton church is one of the most atmospheric places in Dorset and is also said to be one of its most haunted. 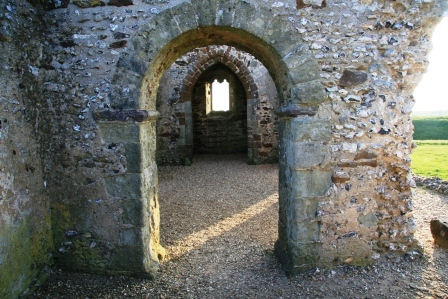 The ruins are imbued with a mystical, almost enchanting, aura and the church’s location at the centre of a pagan circle stands as a testimony to a long ago clash of religious creeds. 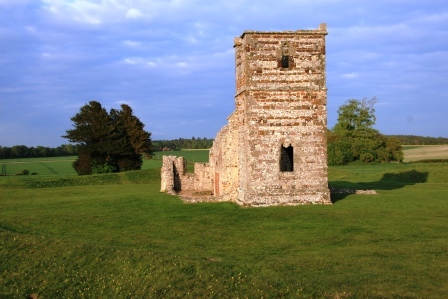 The church was built in the 12th century and was added to over succeeding centuries. The way in which it was deliberately sited in the middle of a pagan place of worship demonstrates how those who were charged with converting the local populace to Christianity did so by adapting older pagan sites and assimilating them into their religion. Standing stones that had been held sacred for thousands of years, were broken up and used in the construction of the church, or else they were toppled and buried in the ground. In 2005 students on a dowsing course at the site unearthed one such ancient stone, which they believed formed part of the stone circle that the builders of the church had toppled and buried in order to demonstrate the superiority of the new faith over the old. 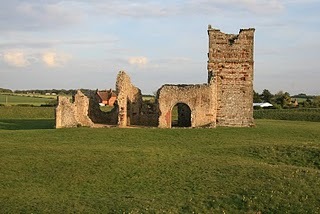 Although the site today is somewhat lonely and isolated, there was once a thriving community in the village of Knowlton. But, in the late 15th century the population was decimated by the Black Death. Its few surviving inhabitants abandoned their village and migrated elsewhere. Their houses gradually fell into decay and were eventually ploughed into the earth where vague traces of the foundations can still be seen a few hundred yards to the west of the church. 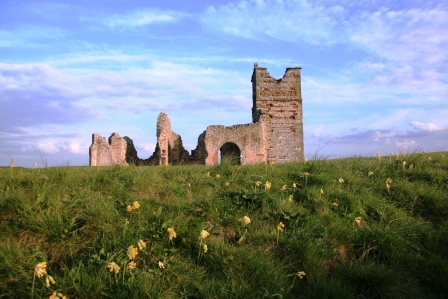 Knowlton Church, however, continued to attract a congregation for several more centuries. But, in the 18th century its roof collapsed and its days as a place of worship were numbered. Today, despite the picturesque surroundings, a certain aura of melancholy hangs heavy over the site and the spirits of some who have passed this way in the last 4,000 years are still said to linger here. A phantom horse and rider are said to gallop across the site in the dead of night. They then proceed to pass straight through the church as though it wasn’t there. Elsewhere, a ghostly face has been witnessed peering from the top window of the tower. Then there is the shade of a weeping woman, whom some accounts describe as a nun, that has been seen kneeling outside the church, although what sin or transgression she is trying to purge herself of is not known. Paranormal groups investigating the site have found themselves enveloped in swirling white mists and have heard ethereal voices chattering around them, although no source of for voices can ever be traced. A lady and her two children who were visiting the site during daylight hours were startled by a tall figure dressed in black that suddenly appeared from nowhere. It proceeded to walk right across their path and then promptly vanished. Others have reported sightings of the same figure in the dead of night and have commented on a truly menacing aura that seems to emanate from it. Ghosts aside, there is a spiritual paradox about this ancient place in that, despite the efforts of those long ago holy men to stamp Christianity over the earlier beliefs of their pagan forerunners, their efforts eventually came to naught. Indeed, for most of the past two centuries their church has lain in ruins with only the spirit of the older faith for company.